… to Bits or Burst into Flames. "During the Second World War, the fighting in Tunisia was all about control of the supply lines. There were a limited number of passes which allowed for adequate communication and movement of supplies through the imposing mountains that marred the otherwise flat plains. 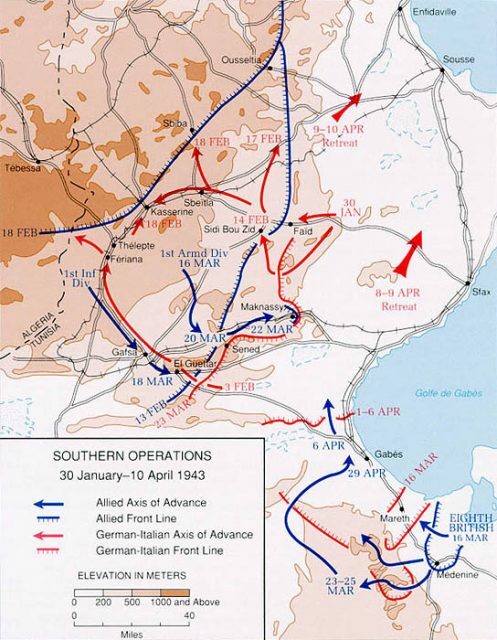 On January 30, 1943, the German forces launched an attack on the French who were holding the Faïd Pass in Tunisia. The ensuing battle not only demonstrated one of the key weaknesses of the Allied troops in North Africa but also displayed the decisive action the Germans were capable of, even as the tides of the war were turning back to drown them…." Wow. My regard for this source just tumbles and falls. This is the second time in a week -- an article on a topic I find quite interesting … there are ample primary and close secondary sources available … and yet we get this level of writing that looks like a middle-schooler cutting and pasting passages he either can't understand, or doesn't bother to try to understand. A little over a month prior to the attack, the Faïd Pass fell to Allied forces. This occurred less than a month after the Americans had arrived on the scene to invade the Axis-dominated Tunisia. The French, aided by American paratroopers, had conquered this strategically important position. Acquisition of the Pass dissected Axis forces between the airbase at Thélepte and their supply base at Tébessa. As such, holding the Faïd Pass was vital to keeping Thélepte and maintaining Allied air superiority in the region over eastern Tunisia. This passage, early in the article, doesn't make any sense. Even if I knew nothing about the Tunisia campaign, I can't make any sense out of these words. For those who don't bother to follow the link, these two paragraphs are split around the map images shown in the OP. So follow the words of the two paragraphs, and then look at the map that is supposed to be right between them. Tell me, can you see any way that Faid Pass (on that map) dissects German (Axis) forces at Tebessa and Thelepta? Is there any interpretation at all of that statement, that can be sensible? Nevermind the fact that the Axis forces WERE NOT AT Tebessa or Thelepta. That requires some knowledge of the campaign. Although, looking at the map, it does seem a bit odd to suggest that the Axis would have had a base of supplies that was some 40 miles behind Allied lines. Details, details. But still, now can Faid Pass even be, in any way, related to the connections between Tebessa and Thelepta? I'd probably use one of my board games if I attempt to game it. I have @ 2-3 that could cover this battle. Since this was posted I`ve found an account of the French defence of Faid by 1st battery 67 RAA (Regiment Artillerie d`Afrique). Combining that with with cross-referencing using Spivak & Leoni`s excellent "Le Campagne de Tunisie" should make an interesting tabletop action.